I took full advantage of the one sunny day we've had in what seems like months to swatch this delicious holo for you! 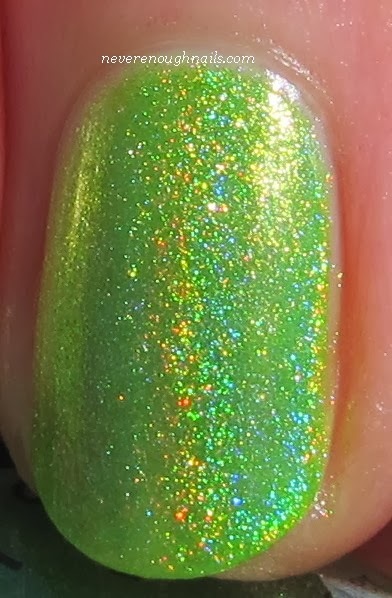 I've had my eye on Smitten Polish Electric Lime for awhile now and finally managed to get it (along with a few other holo treats) a few weeks ago in a restock. Electric Lime is a stunning bright lime linear holo. Out in full sun, it was crazy bright and throwing rainbows all over! I love holos, but sometimes I feel like everyone does the same colors over and over and over again. Pale pink, silver, light blue, pale pink, silver, light blue, etc. Throw me a LIME, baby! Smitten really has a gorgeous array of holos, I picked up four in total, so you'll be seeing them. This is three coats with no base or top coat. Two coats was pretty opaque, but I did a third for my fussy camera. The formula was fantastic, no dragging or patchiness. It was nice and thin, but not at all runny. Probably one of the easiest holos I've used, right up there with the Color Club Halo Hues. If you think you need this, and believe me, you do, check out Smitten Polish on Facebook to find out when she'll restock her Big Cartel store. Thanks Kimberly! I loooove this one!